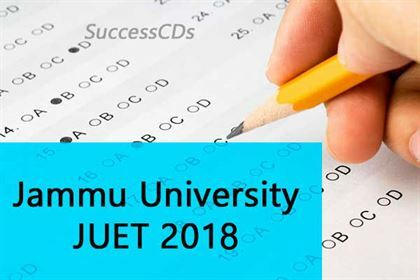 Jammu University Entrance Test (JUET-2018) for UG , PG & Diploma programs. Biochemistry (Self-Financing), Biotechnology (NRI/Self-Financing), Botany, Buddhist Studies, Chemistry, Commerce (M.Com), Computer Science & IT (MCA), Dogri, Economics, Economics (Specialization in Public Policy), Education, Electronics, English, Environmental Sciences, Food Science & Technology, Geography, Applied Geology, Geology (Hydrology And Soil Dynamics), Hindi, History, Home Science (Human Dev. ), Home Science (Clothing & Textiles), Human Genetics (Self-Financing Course), Information Technology (M.Sc. IT), Kashmiri, Law (LL.B - 3 Years Professional), M.Ed., B.Lib.I.Sc., M.Lib.I.Sc, B.P.Ed, M.P.Ed, Mathematics, Microbiology (Self-Financing Course), Music, Physics, Political Science, Psychology, Punjabi, Remote Sensing & GIS (Self-Financing Course), Rural Development, Sanskrit, Sericulture, Sociology, Statistics, Urdu, Zoology.